With our 2018 season underway, we continue to focus on providing these vital transportation construction industry skills, certifications, and licenses. If you have graduated from a Massachusetts State Pre-Apprenticeship Program, you are eligible for Program services. This opportunity if available only to Pre-Apprenticeship Program graduates. Workforce development is an integral aspect of UMass Transportation Center operations, from current Baystate Roads and UMTC-Transportation Training Institute classes, to researching new technologies and processes that will become future training topics. Improving the capabilities of our current workforce and planning for the future is key to a successful transportation sector and Massachusetts economy. In 2016, the most recent of these UMTC programs kicked-off with a focus on developing the next generation of transportation construction workers. 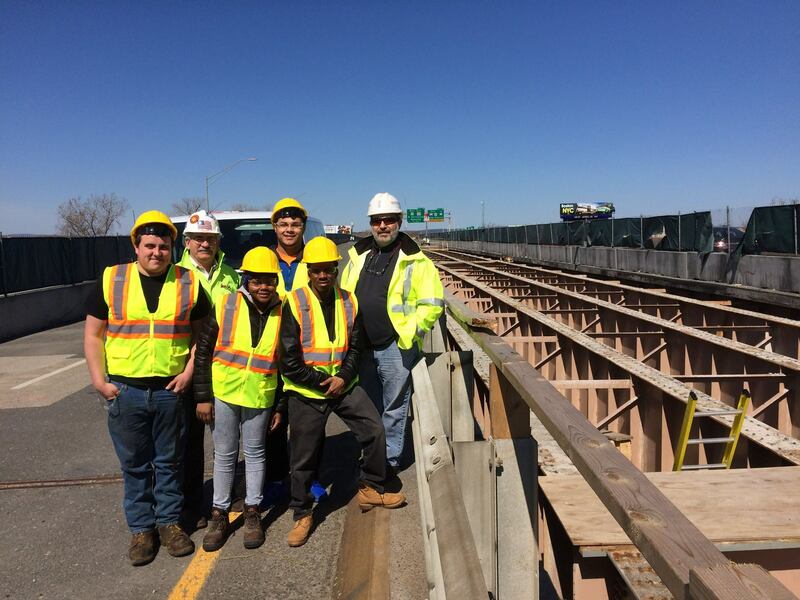 Made possible through funding provided by the MassDOT and FHWA, this On-the-Job Supportive Services contract expands opportunities for women, minorities, and disadvantaged young adults entering careers in transportation construction. As our construction workforce ages, opportunities for young adults – whether within local Departments of Public Works, private sector companies and union positions are significantly expanding! And the range of possible careers within the Transportation Construction industry is SUBSTANTIAL! September 12, 2018 - Shaun recently completed, and is most appreciative of the opportunity to receive his CDL B license through the OJT/SS Program. Astro Crane co-owner, Marty Wright encouraged him to take advantage of the program as it makes him a more versatile and valuable employee. Shaun’s next step is to apply for a hoisting license to operate the cranes, once he is more familiar with the million dollar pieces of equipment. The 2018 graduate of Minuteman Career and Technical High School has a long and prosperous career ahead of him in the heavy equipment industry. Congratulations to Terhon Donovan & Tashin Roberson! August 1, 2018 - Terhon Donovan of Worcester and Tashin Roberson of Springfield (pictured above), recently completed their CDL-B training at the New England Tractor Trailer Training School and passed their CDL-B exam. Terhon is a graduate of the MassDOT Building Pathways Program and lives in Worcester. He is OSHA-10 certified and is extremely eager and ready to pursue a career in the construction industry. Tashin is a MassDOT Community Works Program graduate and a Springfield resident. He is also a certified flagger, and has completed both CPR/First Aid/AED and OSHA-10 training. Tashin says that he is ready to begin a new career in the construction industry, is versatile and flexible, enjoys challenges, and never gives up! Contact us, if you have any employment leads for these fine men. Congratulations to Kevin Asante for accepting a job at the Worcester DPW! He graduated from the MassDOT Pre-Apprenticeship Program and received his CDL-B license from NE Tractor Trailer Training School, through UMTC's Workforce Development Program. Good luck and stay in touch! Congratulations to the three new CDL B program graduates; they are ready to go to work! Jahlil Drewery-Gilbert, Theresa Hayes and Curtis Coker-Johnson completed their CDL Class B training through the UMTC Workforce Development Program and passed their road test last week. (Jacyn is still in training). Jahlil and Curtis live in the greater Boston area while Theresa resides on the South Shore. If you have an opening in your DPW or know of an opening in the highway construction industry, please let us know. The first three UMass Transportation Center (UMTC) Workforce Development participants have received their CDL-B licenses! June 12, 2017 - Xavier Kinlaw and Kevin Asante of Worcester (Asante featured in photo above) and Francis Dingman of South Hadley recently completed their CDL-B training at the New England Tractor Trailer Training School and passed their CDL-B exam. All are graduates of MassDOT Pre-Apprenticeship programs and are looking forward to working with a highway construction contractor, municipal DPW or state DOT. We have fifteen other UMTC participants in various stages of training, and will let you know as soon as they receive their licenses. Please notify us of any openings in your department and we will pass them along. Pilot Project participants, Kyle Thibodeau, Imaghe Paul, Kym Barnett, and Lavan Cope, getting a tour of the Springfield Viaduct Project from Ralph Romano, MassDOT (on right), and accompanied by Jeff Cathcart, UMTC. Imaghe Paul, finishing a concrete sidewalk in Westfield. Jose Laporte, Julie Arce, and LaTore Harris, checking the weight of a jack hammer. • Install forms for concrete sidewalks and retaining walls. • Landscaper – highway vegetation, etc.